A hand crafted item popular among the native Americans, the dream catcher is a compilation of woven strings in the form of a circle adorned by feathers, strings, gems and such. This is an all natural item which is usually hung from the doorways portraying prevention of negative thoughts and vibes through the woven entanglement which would mean only the good and the positive vibes can get through it. There is another conception to the dream catcher where some believe the negative thoughts are allowed to pass trapping in the positive thoughts so that they can accompany you everywhere. 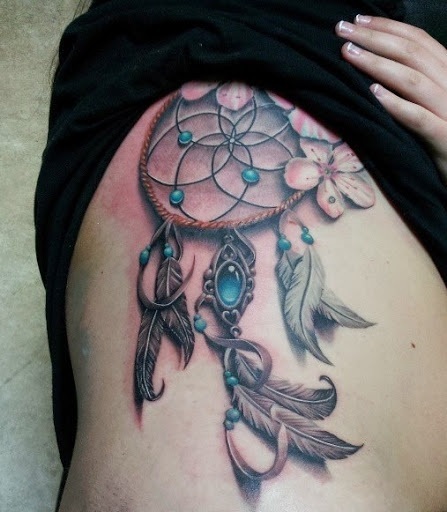 The amazing dreamcatcher tattoos is mainly popular amongst the ladies, dream catcher tattoo on ribs, and dream catcher tattoo on back being the most common places. Take a cue from these beautiful dreamcatcher tattoos given below and opt for the best suited one. 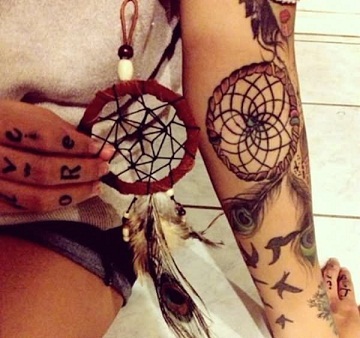 Here are top 20 Dreamcatcher tattoo designs that you may like to sport. Introduction: The Dream catcher is a native American belief that is said to filter negative thoughts away and restore the positive thoughts. Different shapes and combinations have different meanings to them. 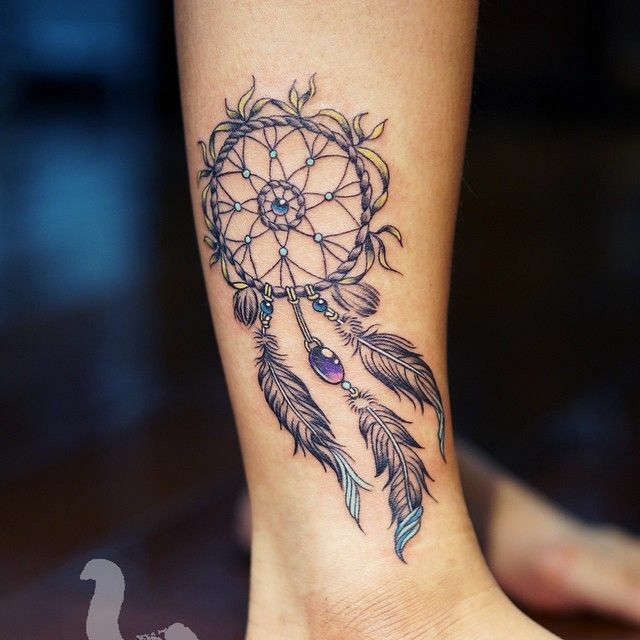 The dreamcatcher tattoo is a trend that gained traction in recent years, and is popular among woman. Due to the versatility of this concept the shapes, sizes and area where its being etched differ. 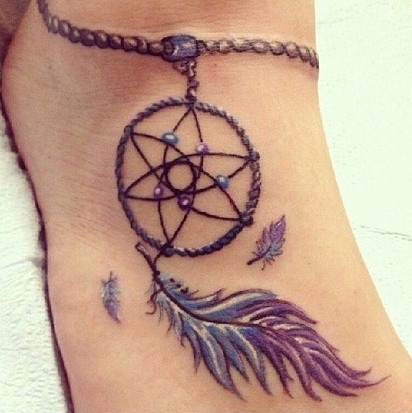 Most common designs are nature and animals like the butterfly dreamcatcher tattoo, lion dream catcher tattoo, eagle dreamcatcher tattoo, or the peacock feather dream catcher tattoo. 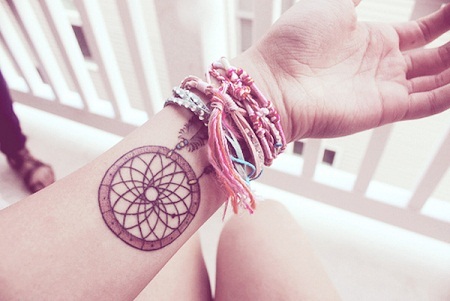 Other forces of nature such as moon dreamcatcher tattoo, rainbow dream catcher tattoo are also popular. 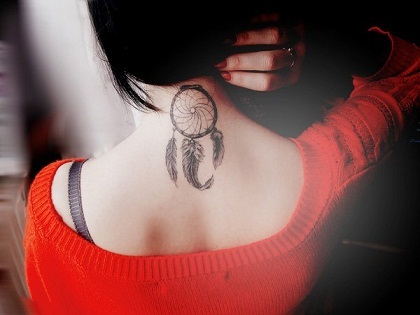 The most popular areas are the dream catcher tattoo on hand, dream catcher tattoo on neck, dream catcher tattoo on wrist. below are a few of the best designs you may take inspiration from. 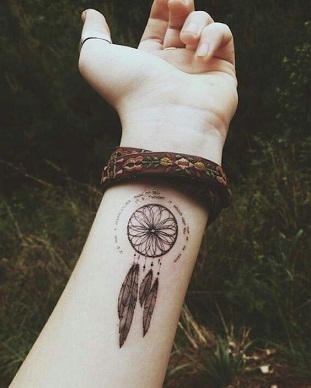 Whenever you opt for a dream catcher tattoo, this will be the most basic print that there is. Hung from a fragile twig is the dream catcher, two spiral bindings adorned by soft feathers, swaying softly in the wind. The back starting from the nape is also enlisted as one of the common places to get a dreamcatcher tattoo. Best Suitable for: Women can inscribe this intricate and beautiful tattoo onto their body. 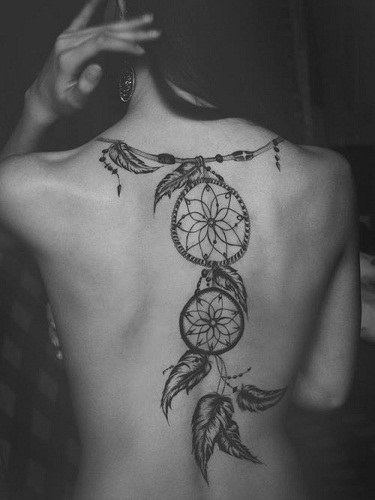 Preferable Ink: Monochrome would be the perfect dream catcher tattoo on the back. Where: Onto the back side of the body. 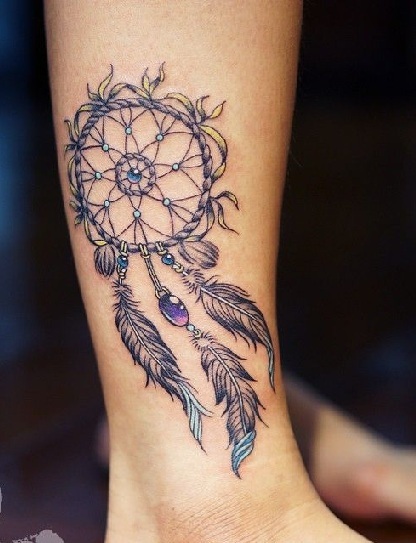 Skin Tone: Woman with fair to brown complexion can have this dream catcher tattoo inscribed. This is a brilliant dreamcatcher tattoo that shows the binding of good vibes gathered and collected from the nature and its beings. As a flock of bird breaks away from one of the feathers of the dreamcatcher, the use of intricate high defined lines and floral add a touch of personal sense to the tattoo. Once again adding a touch of floral to your dreamcatcher, the beautiful tattoo ends with a pair of blooming sketched roses finished with a butterfly, a sign of vibrancy while the dreamcatcher with its elegant feathers looked mesmeric. 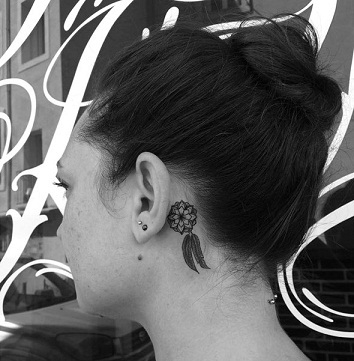 You can also add a few birds on the side like this tattoo to play up the nature quotient. This tattoo is one of a kind starting with the wolf heads, slanted upwards howling as we see, portraying a sense of mystery and power probably. However, the dreamcatcher down below made into a basic native design can create a juxtaposing meaning of good vibes and light heartedness and fragility. Best Suitable for: Men who identify themselves with courage and perseverance can have this tattoo. Preferable Ink: Usually designed in monochrome, however red colour will also be perfect. Where: This tattoo can be done onto their arm, or onto the chest. Skin Tone: Men with most complexion can get it. All these while the dreamcatcher was in sketched from not allowing you to experience the actual vibrancy and life in the object. In reality, dreamcatcher’s are made catchy and attractive and here’s one portraying that with a slight swish of cold blue backgrounds that gel so well with the tattoo. Best Suitable for: Men and women can don this tattoo which depict the opposite forces of everything in nature. Preferable Ink: Red, blue, green, yellow brown and black can be used in this tattoo. Skin Tone: People with fair to brown complexion can have this tattoo. If you are not wanting to go full out on colors with your dreamcatcher you can opt for this unique design where the chakra bound by entanglements are kept in basic black while the feathers sport a handsome electric blue hue which brings out the beauty of not only the tattoo but the object itself. Best Suitable for: Women can etch this basic design tattoo onto their body. Preferable Ink: A colour combination of blue and black will make this tattoo perfect. Where: Onto the sides of the ribs and belly. Skin Tone: Woman with fair to brown complexion can have this tattoo done on them. Here is another fun dreamcatcher tattoo design that shows a quirky entanglement of different meshes oozing out from the chakra of the dream catcher while the use of a white blooming flower is actually breathing life and beauty to the work of art. 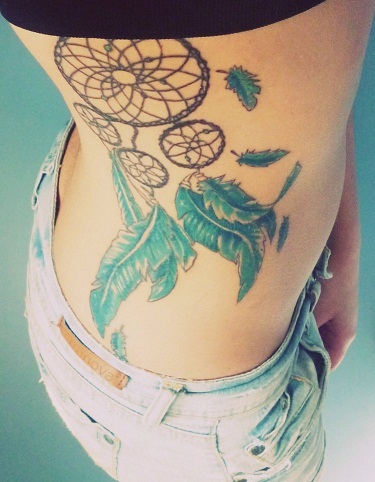 It is the perfect dreamcatcher tattoos for females. Where: This tattoo can be placed on the arms or the thighs. Skin Tone: Fair to wheatish skin tone. In its crude form, without the wired meshes or the gems and the colorful feathers, this dreamcatcher looks forlorn and lonely but also something that stands out from the lot looking simply fantastic even though it has a rugged look to it. 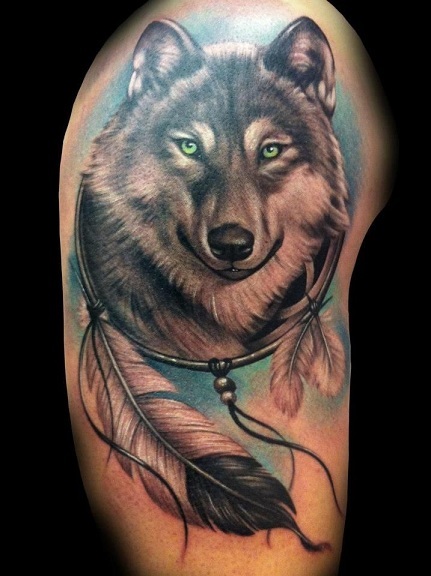 This is one of the best dreamcatcher tattoo designs for men. Best Suitable for: men and women can get this raw, toned down tattoo. Preferable Ink: Brown for the twig, silver for the feather, red, blue for beads and yellow for the feather can be used. Where: This tattoo can be traced onto the arm and deltoids. The last dream catcher tattoo is a moon goddess inspired dreamcatcher where the crescents of the moon on either side shows the beautiful soft hued feathers, the brightness of the art does justice to the vine design in black. Best Suitable for: Women who treat themselves as goddesses and carry themselves so, can get this minimalistic tattoo done. Preferable Ink: Black for the outline along with blue and silver for the feather. 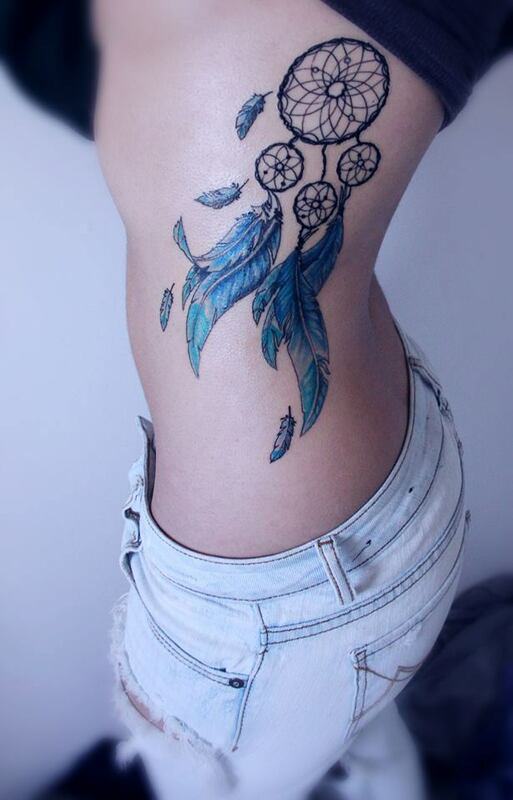 Where: This moon dreamcatcher tattoo can be drawn onto the sides, or the midriff. Skin Tone: Fair to dark skin tone. Here is a naturally done dreamcatcher tattoo designs on someone’s shoulder and arm. As should be obvious they have decided on a great deal of quills on this one and at times individuals will pick a specific winged creatures plumes that have some sort of imagery to them. This is the perfect dreamcatcher tattoos for guys. 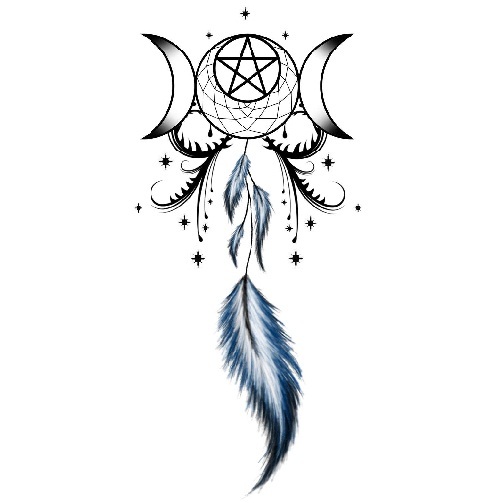 Best Suitable for: Men and women equally can carry this three feather dream catcher tattoo design. 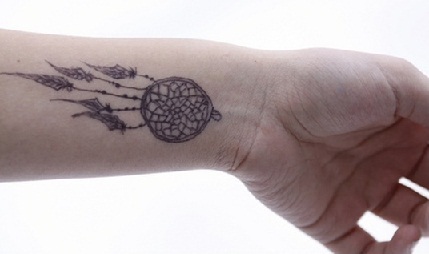 Preferable Ink: Monochrome would give a sense of eternity to this dream catcher tattoo. Where: This tattoo can be etched on the arms. Size: Small to medium size. This is one of the finest examples of excellent craftsmanship and impeccable work of art arrangement. Not just is the dreamcatcher tattoo sharp and distinctive with truly wonderful line work, but at the same time it’s arranged in a spot that is very hard to resist. It is deliberately put tattoo—and are attractive whichever way you take a gander at it. I cherish how the winged animals are splitting far from the center plume. It adds profundity being an emotional dreamcatcher tattoo idea. This, privilege here, is stunningly marvelous in each feeling of the word. 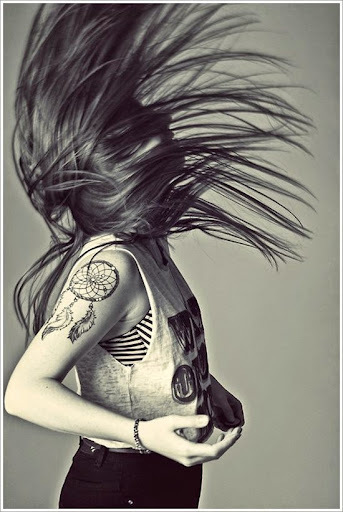 Best Suitable for: This flower dreamcatcher tattoo can be endorsed by woman. Preferable Ink: The pink, blue, black and brown colour scheme is what makes this intriguing. Where: This tattoo can be etched onto the sides of the body. Skin Tone: People with fair to wheatish skin can try out this 3d dreamcatcher tattoo. Delightful and strong line work, accompanied by Fancy and complicated configuration, along Consistent mixes of themes, this picture rightly defines wow. 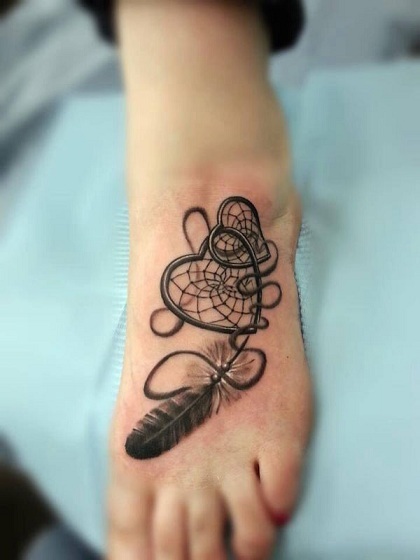 This unique girly dreamcatcher tattoo is without a doubt a standout amongst all. With an eye-popping talisman, sparkling dabs, similarly electrifying smaller dreamcatchers and exquisite blooms on top, this dark and dim tattoo is a genuine mesmerizing beauty. It has the perfect measure of sweetness and coarseness, exactly what the specialist requested. Who needs abundances when you can create an impression with insignificant shading and plan blends? This equitable demonstrates that in craftsmanship, nuance is an ideals and when there’s nuance, there’s excellence. Best Suitable for: This flower dreamcatcher tattoo screams feminine, and certainly compliments any dress woman would want to wear on any occasion. Preferable Ink: The pink, green and black colour scheme is subtle. Where: This tattoo can be drawn onto the arms or to the shoulders. Skin Tone: People with fair or wheatish skin. 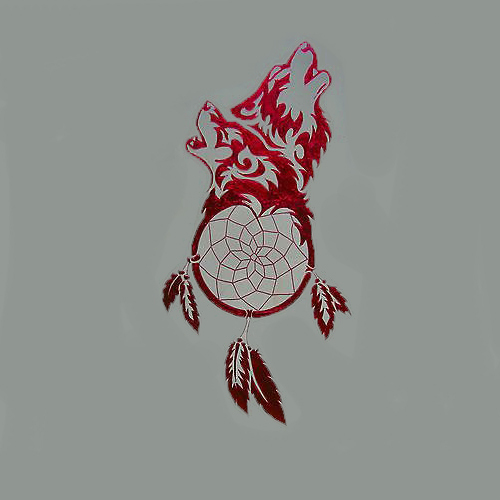 In the event that you need to symbolize numerous meanings with only one picture on your body, the wolf dreamcatcher tattoo for men is the perfect decision for you. Both components are profoundly typical and look awesome independently, so consolidating them ought to deliver far superior results. Utilize a few tips and thoughts that can get your innovativeness working and give you the motivation you requirement for the configuration. Best Suitable for: The feather, icy cold background and the soul gazing eyes of the wolf is definitely a masculine art form. 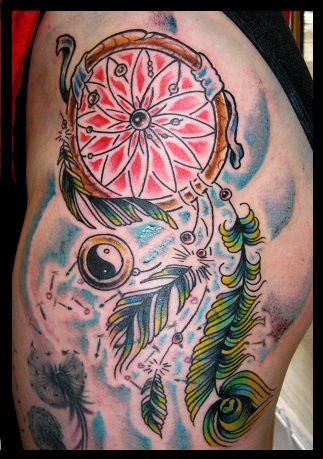 Preferable Ink: The blue, green, and black outlines help in highlighting this native American dreamcatcher tattoo. Where: The arm or the nape area depending on the size. Skin Tone: People with fair, wheatish complexion. 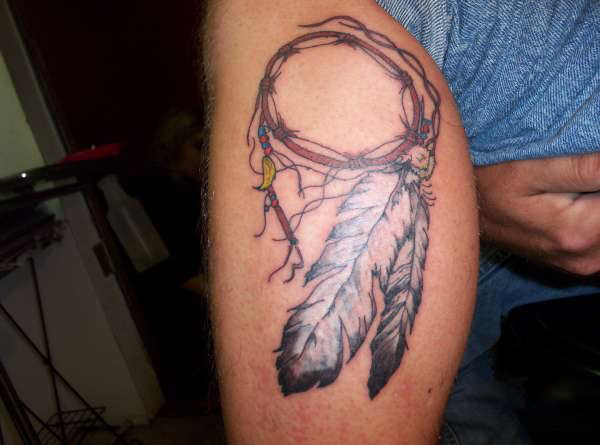 The tribal Dreamcatcher tattoo for men is an extremely well known one among the folks; the outline can be inked on arms, necks, shoulders or backs. This implies the person with the Dreamcatcher tattoo can parade it perfectly. At the outset, tribal tattoos were a type of articulation of one’s religious convictions. Today, much has changed in the tattoo world and tribal tattoos are worn more to put forth a style expression since they make extravagant objects of craftsmanship. 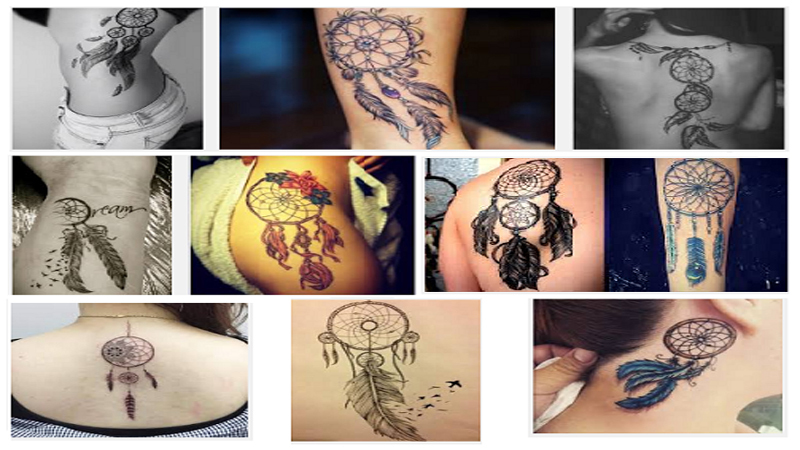 Best Suitable for: The tribal dreamcatcher tattoo is usually for men;however, woman too can have them. Where: This tattoo can be drawn on practically any part of the body like the arms, forearm, chest, nape or the calf. Best Suitable for: Woman or young girls who would like to flaunt their uniqueness. Preferable Ink: this tattoo has a sort of peppiness which is achieved with blue, purple, yellow, red and black used as the dominating colours. These tattoos accompany assortment of ideas. A portion of the plans will have swords, strips, blossoms, heavenly attendants connected with them. Today we can see numerous individuals, who are for “adoration” and some are against ‘affection’. On the off chance that a man is against adoration, then there are plans in heart dreamcatcher tattoos having bolt penetrating the heart which demonstrates some blood stains. For the most part these tattoos are planned with the assistance of dark and red shading. In any case, today the pattern has changed and there are tattoo architects, who will plan in various hues like pink, green, yellow blue and so forth. 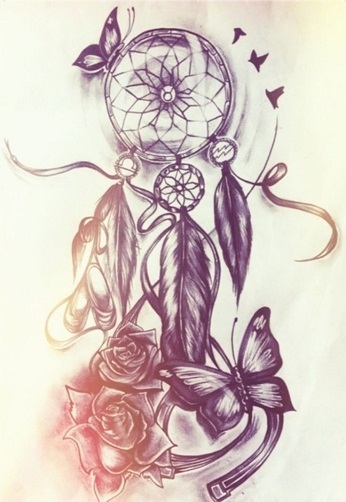 This is one of the best dreamcatcher tattoo designs for women. Best Suitable For: The conjoined hearts, tangled and pierced by a feather depicts the state of the person being in love or the remembrance of an old love. Perfect for a woman foot tattoo dreamcatcher. Preferable Ink: Black and silver. Where: This tattoo can rightly be placed on the foot. Skin Tone: Fair to Brown skin complexion. At the point when the topics are as captivating as a dreamcatcher and a raven, particularly when the previous is fused in such a dynamic path, to the point that it’s dangling on the last’s mouth, it is outside of anyone’s ability to see! This brilliant back piece passes on feelings not at all like some other and the dark and dim shading blend gives a feeling of distress or distress that hued tattoos can’t and will never have the capacity to do. The wind underneath or more the raven’s wings is a decent touch and it gives a figment that it’s open to question. Best Suitable For: This is an elaborate masterpiece of intricate details and perception which both men and women can don on their skin and feel great in proclaiming it to the whole world of. Skin Tone: People with fair or wheatish skin complexion. This watercolor dreamcatcher tattoo meaning passes on that rationale in unbelievably prepared smeared hues inside and around the piece. It is something that you don’t see frequently and most likely the stand out of its kind. It is A practically looking water shading tattoo that is both entrancing and spectacular. What’s more, legitimately so as it is exceedingly unique, daringly innovative and expertly executed. Best Suitable For: This watercolor dreamcatcher tattoo has a feminine touch, however men too can have this etched into their skin and feel great about having it. Preferable Ink: This art is like a rainbow dream catcher tattoo which covers most of the colour spectrum. These type of traditional American Dreamcatcher Tattoo designs are an extraordinary method for indicating connection to one’s underlying foundations. America is frequently connected with a specific appeal in the name and the Native American race are amazingly pleased with their foundations. 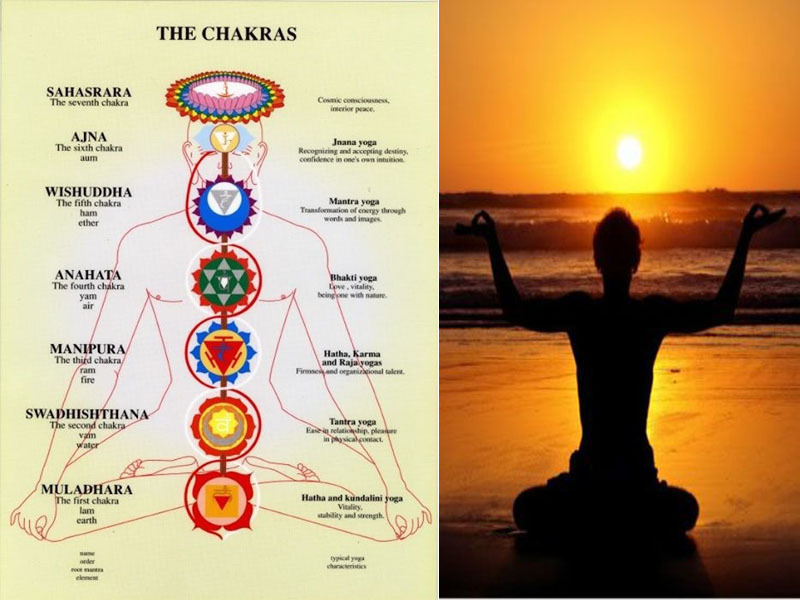 A few people may think it is an odd method for exhibiting connection to one’s underlying foundations, yet there are numerous individuals who are enchanted to demonstrate their most profound sense of being, solidarity among different Indian societies and agreement with nature through Dreamcatcher tattoos. Best Suitable For: A tattoo that portrays one’s affection to their home country, or their love for travelling. This is a perfect unisex dream catcher tattoo design. Where: The forearm, under the ribs or nape. 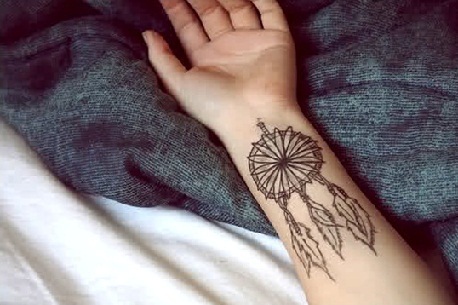 It may be a peculiar and somewhat cartoonish version of a dreamcatcher tattoo however it doesn’t imply that it’s less engaging or charming to have. In the event that you take a gander at it nearly, the lines are still perfect and strong and the hues and shading are apropos used with better than average consciousness of clear spaces inside the circle. It’s only a fun and adorable piece and would without a doubt be ideal for the women who have sunny auras and are not hesitant to attempt new things. 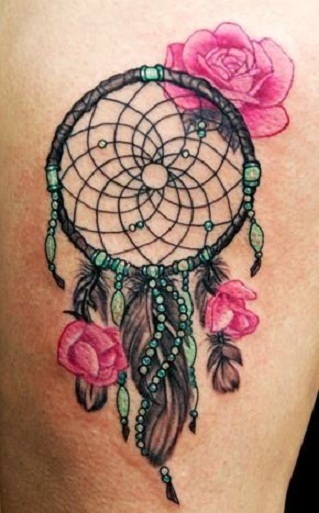 It is one of the popular dreamcatcher tattoo designs for girls. Best Suitable For: Best suits women who are outgoing, likes to try out something different and would like to display their uniqueness with pride. Preferable Ink: With violet dominating and a touch of blue and yellow. Skin Tone: People with fair or brown skin. A decorative dreamcatcher tattoo combined with other cultic symbols or characters, makes the tattoo unique and special. The feather depicts the wisdom of the owls and the courage of the eagle. Most people don’t know the origins and the meaning when getting inked. You can either choose colourful ones or something simple and classy like the one here. Best Suitable For: Suitable for woman and men, who would like a tattoo on them without being loud about it. Preferable Ink: By leaving most of the interiors blank and showing the skin, the outlines have been coloured with black. Skin Tone: Light to brown skin tone. The specialty of dreamcatcher tattoos is that they can be placed anywhere on the body like the one here, behind the ear. 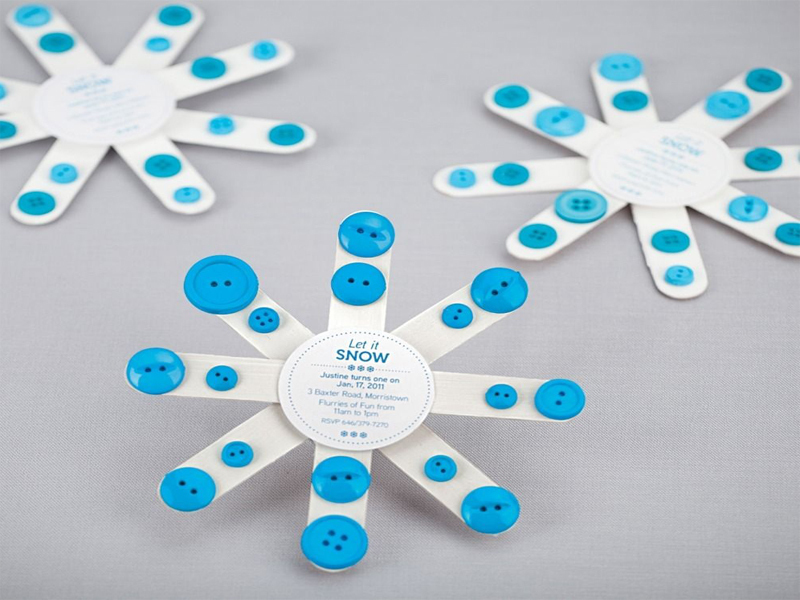 They can in different sizes small, medium and large. The size is a personal choice and varies from person to person. If you want a small one, choose a simple design. 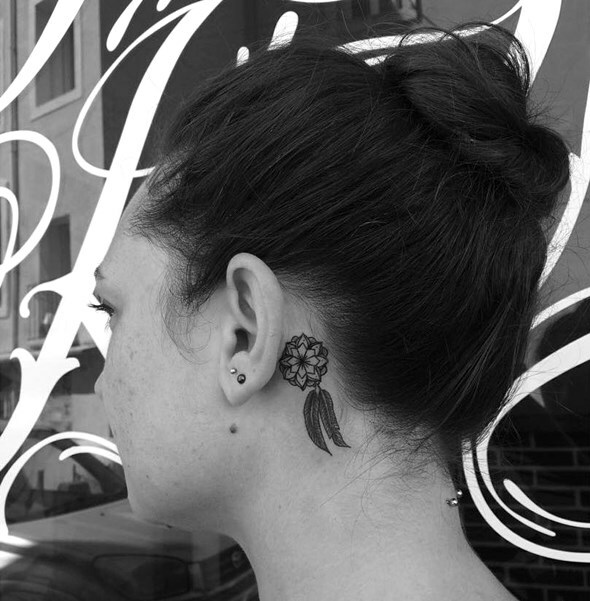 Make an intriguing statement with a tattoo with minimal feathers hanging and a flower-based ring. Best Suitable For: Suitable for woman who wants to stand out unique and be recognised by the ink they wear. Preferable Ink: Pure black with the inner area of the tattoo untouched. 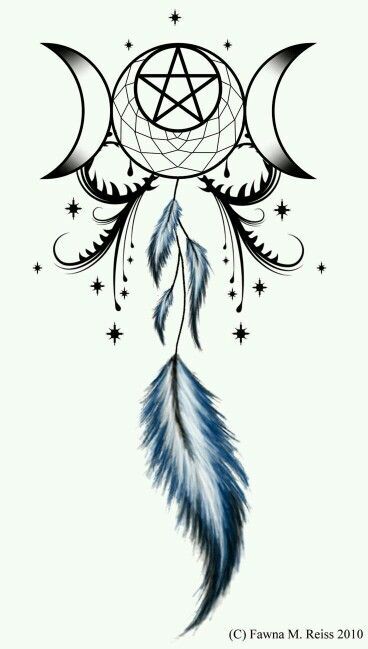 Where: If you want to show off then this art is a perfect dream catcher tattoo on neck. 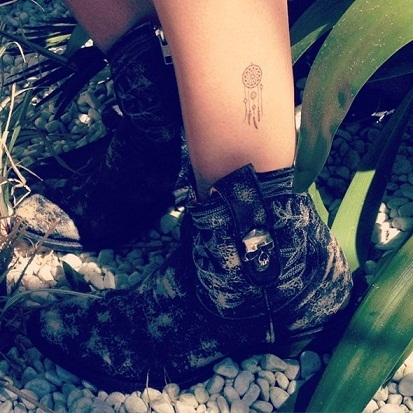 Small Dreamcatcher Tattoos for girls. This tattoo is also available for guys too. 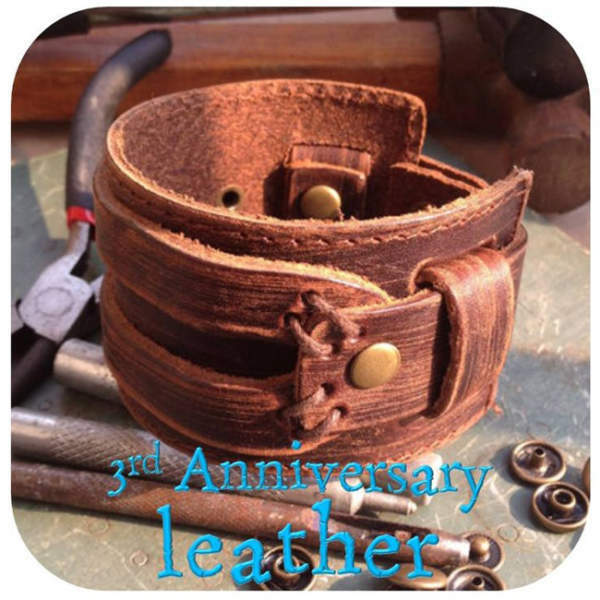 The design is simple and timeless and can be worn on any part of the body. This simple and delicate design looks like pencil art and is classy. The intricate design is carefully drawn, and your tattoo artist must be an expert with thin needles. Choose a small tattoo that suits your style and attitude. Best Suitable For: Ideal for women who are adventure junkies, love being outdoors, and like to show some skin, along with staying classy on any chosen day. Preferable Ink: Pure black with thin outlines. 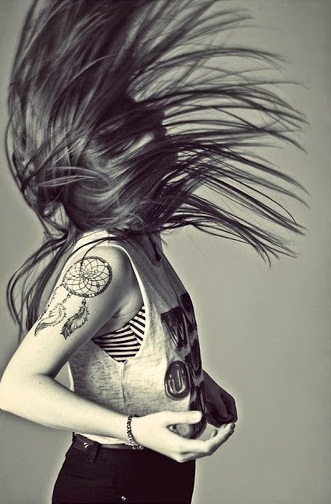 Girl with shoulder Dreamcatcher Tattoo. Women often have dreamcatcher tattoos in a smaller form on their shoulder, creating an elegant look. The shoulder provides support and space for the design to be visible and more focused. This is an awesome design and tattoo placement for women and looks incredible. 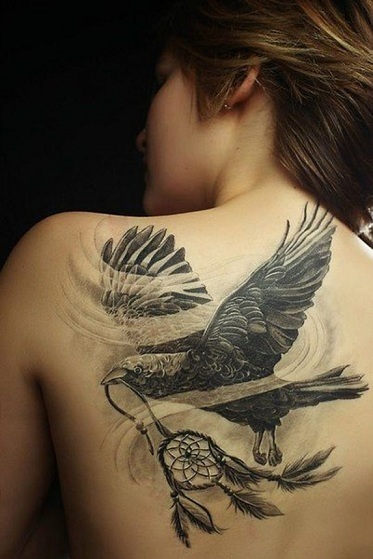 The feathers are highlighted and the innovative design makes the tattoo stand out. 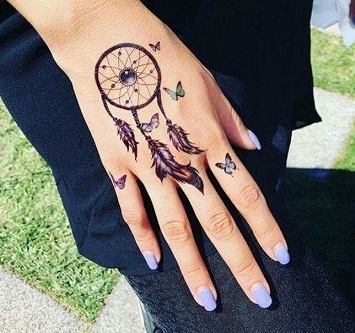 Best Suitable For: Perfect for girls who are cool, peppy and outgoing in their nature, amazing dreamcatcher tattoos are style statements that differentiates you from others. Preferable Ink: Black or coloured designs are good options. Size: Small to medium sizes are apt for this area. 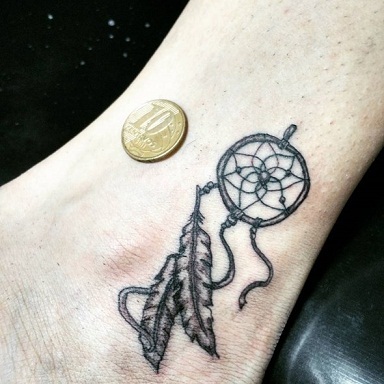 It is not advisable to have dreamcatcher tattoo design on hand because you won’t get enough space for the tattoo especially if you have tiny hands. If you don’t have tiny hands, then this is a beautiful and realistic dreamcatcher tattoo design for you. Best Suitable For: woman who aren’t scared of inhibitions and others opinions. Where: On the hand starting above the wrist and extending towards the fingers. Skin Tone: Looks good onLight to brown skin tone. Here is an example of someone putting their own twist on the dreamcatcher with their own passion. This simple design has been modified to have the web look like that of a sunflower. Best Suitable For: The floral design incorporated into the dreamcatcher is a great example of imagination, and uniqueness, and is a design a woman can flaunt without hesitation. Preferable Ink: Keeping it monochrome would give it an everlasting fineness. Where: below the wrist ending halfway through the forearm. A tattoo on the neck area usually describes that someone is risky or daring and tends to make bold choices. After all, the neck is an area that will almost always be exposed, no matter what type of clothing the person has on, and this area of the body is particularly painful for tattoo placement. The images for tattoos used for a neck vary based on the person’s preferences. The back of the neck is one of our favorite and loved spots for the dreamcatcher tattoo as they’re not easily visible. You have an option to cover up your tattoo when you untie your hair, which gives you a couple of different style options and show off the tattoo with an up-do.Some people choose the back to depict the end of something – a relationship or life or something significant. 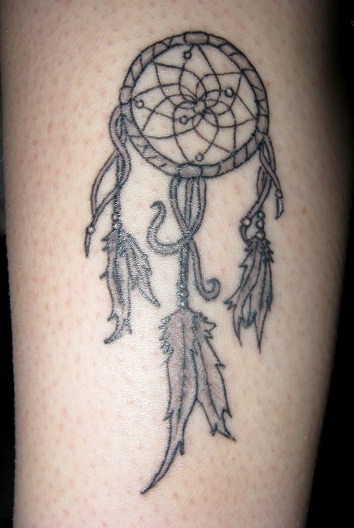 Best Suitable For: Dreamcatcher tattoos are for the most part suit woman better than men, so does this. Here’s a great example of how you can complement your dream catcher tattoo with hand made bracelets on your wrist. This Tattoo on the wrist is proof that dreamcatcher tattoos don’t need be massive and across your whole back to look pretty. This is a great smaller design in only black ink on the wrist that looks great. 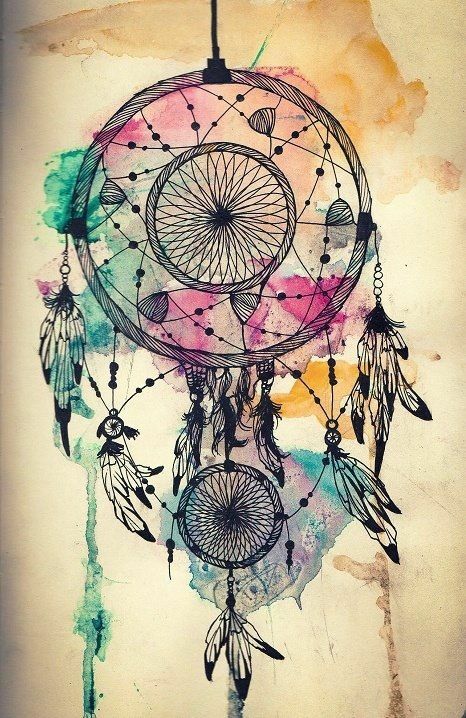 Dreamcatchers can be colourfully inked or can be monochrome. In this tattoo, the wearer has chosen to go with more feathers. You can also choose any feather of your choice or of the birds you like. Originally, dreamcatchers were designed with eight points, to signify the eight legs of a spider. You do not have to stick to the traditional designs just like all the other tattoos. The dreamcatcher can be personalized and decorated to reflect your personality. Since it is considered to be a protective talisman, a dreamcatcher tattoo then can bring the feeling of security and well-being to the wearer. These tattoos also signify nature and represent the freedom and power it offers. Preferable Ink: Black or with a tint of violet. Skin Tone: Fair to brown skin tone. If you’re thinking of getting a tattoo, you have probably puts lot of thought into the design, and its symbolism. The forearm represents both stability and strength, and a lot of people might choose a forearm tattoo to bring attention to their muscles. Forearm tattoos are a growing trend with men. However, several women have also decided to get inked on their arms as well. Forearm tattoos serve to commemorate a personal or a shared experience, and to remind themselves about personal milestones or achievements and remembering a loved one among other reasons. 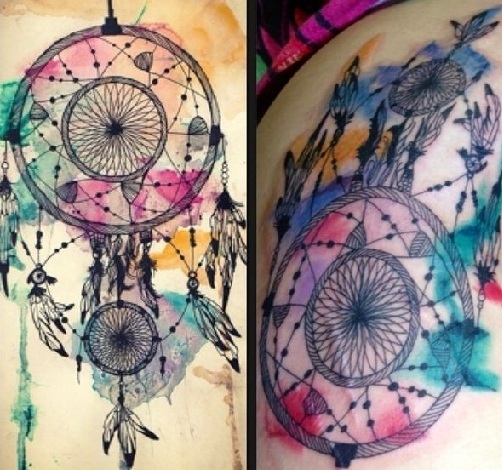 Best Suitable For: These amazing dreamcatcher tattoos are definitely not for the faint hearts. Its loud, strong and evokes attention. Woman who would don this tattoo are definitely rogue in nature and hence this dreamcatcher tattoo meaning resonates with its wielder. Skin Tone: Fair or wheatish. Best Suitable For: Party goers, free willed, woman who wants to have something for a change should consider getting this tattoo. With its 3D modelling and simplicity in design this is something that would go with your attitude. The peacock stands for its beautiful tail, its nature to flaunt its beauty to attract the opposite gender, and to carry itself in the most poised manner. The ock tail is used in different culture differently. In some beliefs the peacock is the even the vehicle for Gods. Flaunting a peacock tail as a tattoo should be done by woman who resonate themselves with the above said attributes. The peacock feather dream catcher tattoo is one of those tattoos that demands attention and hence is one of the most sorted out tattoos among woman. 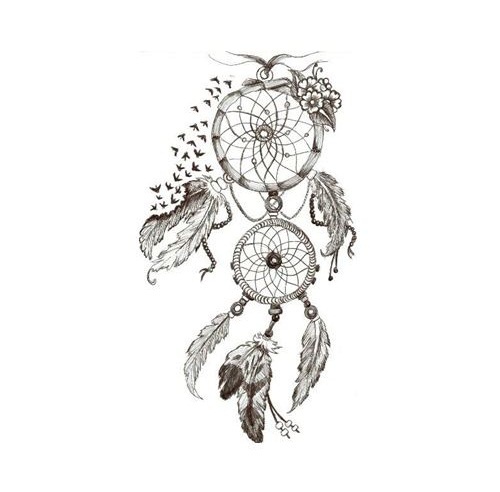 Best Suitable For: Woman who like to be noticed by the men, carry themselves in the most respectful manner can decide to have these amazing dreamcatcher tattoos onto their body. A floral design could also be incorporated. 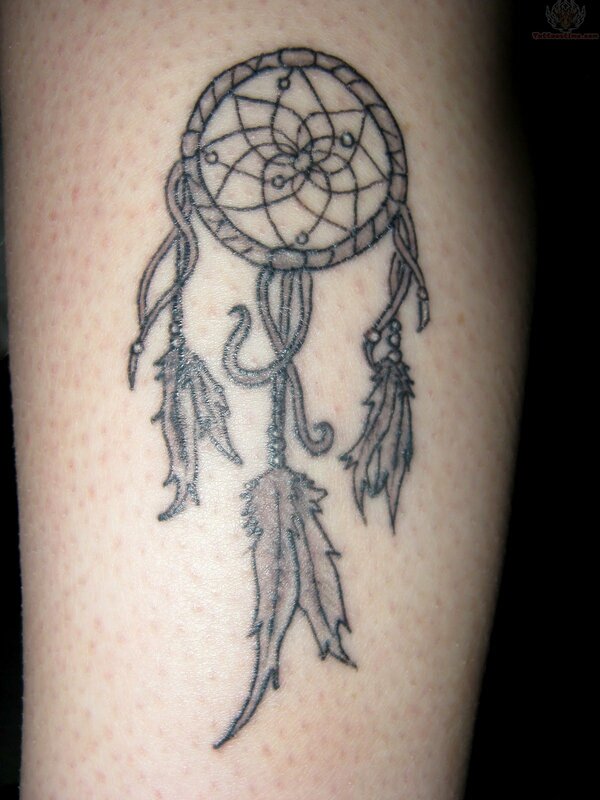 For the inked individual getting a Dreamcatcher tattoo is ensured to pull in a great deal of consideration. Tattoos are hot and getting more sizzling! There’s significantly more to tattoos than putting forth a design expression. 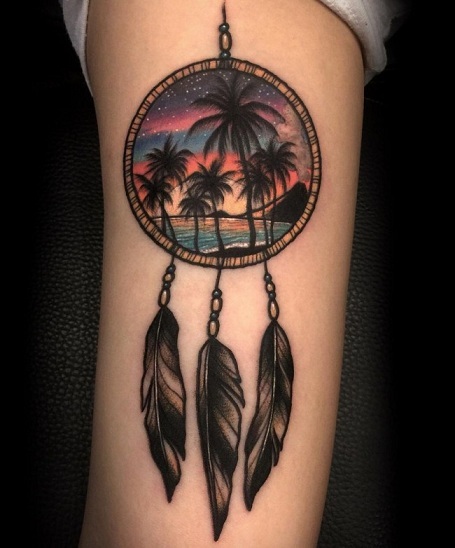 The imagery behind the Dreamcatcher tattoo is that it compels great dreams upon the wearer all through the dull night, until sunlight day breaks. We have got a list of trendy and simple dream catchers covered here. Once you get inked, make sure to take good care of it. To prevent infection, make sure you only get inked from the finest and safe place in town. Look out for itchiness or other signs that your body shows. Get inspired and get inked today! Best Suitable For: The scattered water colour in the background along with the dreamcatcher in the foreground is a great example of a design that woman can have. 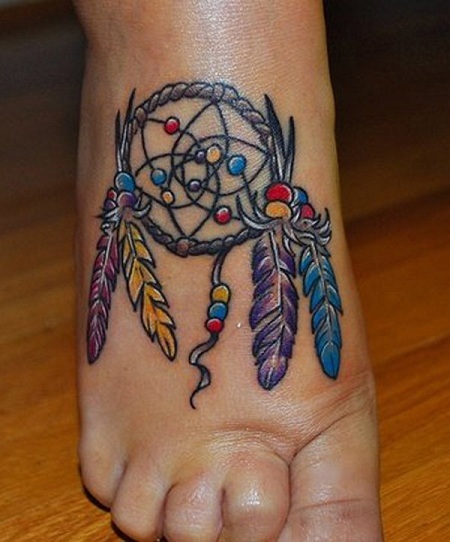 Preferable Ink: Every colour palate can be used in this rainbow dream catcher tattoo perfectly. Finding a dream tattoo for your body is tough, and it’s even tougher to find a great artist that can put your idea onto your body. Many aspects such as previous work, safety precautions, the ink and the needle used for the procedure should be researched into prior to jumping on the tattoo wagon. It’s also necessary to lockdown a tattoo design that you will not go on to regret in the future. 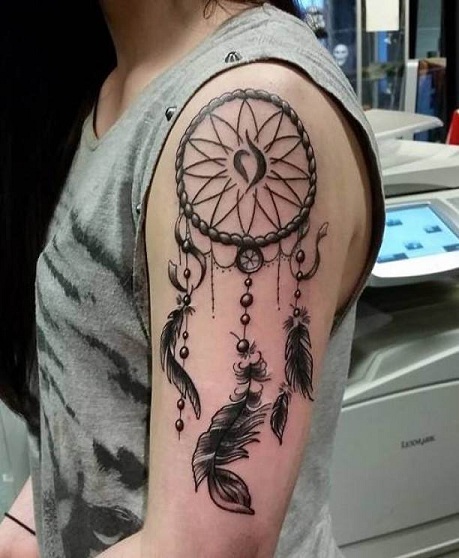 Going through all these aspects will ensure you a great experience in getting the perfect dreamcatcher tattoo that you would go on to cherish your whole life. Alas, most of our readers ask us about how they can lock down on a particular Dreamcatcher design. 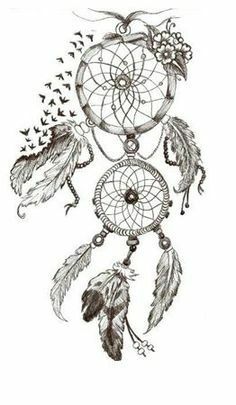 As our article suggest, the aspects that you need to consider on getting a dreamcatcher tattoo design is You! You need to summarise your thoughts and your traits, and the image you would like to portray in public. As far as our opinion goes, you can’t go wrong by choosing any of the above mentioned dreamcatcher tattoo designs, to flaunt for eternity. Image Source: 1, 2, 3, 4, 5, 6, 7, 8, 9, 10, 11, 12, 13, 14, 15, 16, 17, 18, 19, 20. 21, 22, 23, 24, 25, 26, 27, 28, 29, 30, 31, 32, 33, 34.